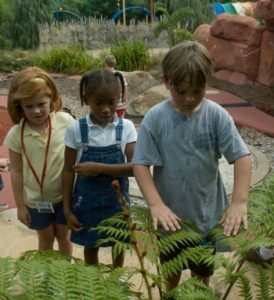 The WOW Children’s Garden offers opportunities for learning and exploration for family members of all ages. Trek across the globe in our world-themed splash fountains and Passport Gardens, see, smell, and touch edible plants on Discovery Peak, and take a nature walk through our Plant Safari habitat gardens. Daily activities include guided and self-guided discovery stations, scavenger hunts, crafts, and walking tours. 9:30 a.m. – 6:30 p.m. (April 1 – October 15) Splash Fountains run April 13 – October 13. 9:30 a.m. – 4:30 p.m. (October 16 – March 31) Limited access to Children’s Garden restrooms in January & February. This Summer in the WOW Children’s Garden, explore the habitats of plants, animals and people. Splash your way around the world! Practice your geography as you explore the oceans, continents, and other notable landmarks on Earth. Splash Fountains run April 13 – October 13. Periodic maintenance may cause the WOW fountains to be closed. At the entrance to Discovery Peak visitors will see a wide variety of edible plants that can be grown here in Tidewater. Many of these will be familiar, while others may seem more exotic. To the right are two vertical “living walls” that demonstrate just how little space is needed to grow a garden. Between these walls espaliered fruit trees are planted. On a circular plaza, several containers grow edible plants, perfect for people who want to garden on a small patio or balcony. Climb Discovery Peak and get a “world tour” of edible and commercial crops grouped by their continent of origin. This is a great place for children to see how cotton and bananas grow, where grapes come from, what sugarcane looks like, and to perhaps get a new appreciation for just how important plants are to humans and wildlife. Follow the world’s Trade Route and find plants from different continents. Climb discovery peak to see how plants that become every day food and products grow. Depending on the season, you’ll find cotton, papyrus, bamboo and some of your favorite fruits, vegetables and herbs. Grown-ups… with your children, gently touch and smell herbal plants, including mints, dill, oregano and more. In recent years, Discovery Peak has also been planted with hardy fruit bearing trees and shrubs that do well in our climate. Many of these plants are not only edible, but are also attractive and would make a nice addition to home landscapes. All of the edible plants (and ornamental ones as well) in Discovery Peak are grown using organic pest controls, only as necessary. This is a great place to dig, climb, and explore. Inside an oversized treehouse, learn about bugs, plant seeds, and well, play in the dirt! Climb, dig and explore in our Dirt Factory. Visit the farmer’s house and barn to learn about fruits and vegetables. Climb into the treehouse to see what life looks like on a treetop. You know what stems, flowers and leaves look like, but our root viewer lets you how plants grow underground too. Plant a seed to take home at our potting table. Tell time with your own body on a sundial, mark birthdays on a colossal calendar, and follow a trail through nearly an acre of wetlands, forests, grassland and desert areas. Explore the Plant Safari to see four distinct North American habitats. Frog Bog. Here you’ll find wetland plants and aquatic life. Frogs, turtles, snakes and fishes make this area home. Can you pull your way across the bog on our floating bridge? Grain Plain. 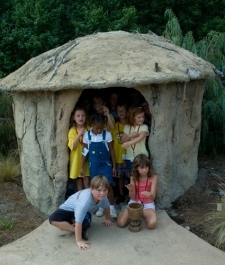 Learn about Native American food sources and crawl into a Tipi. Whichway Woods. Explore all the layers of a forest and visit a Log Cabin to learn more about how we use trees in our daily lives. Prickly Pear Lair.  See plants found in the American southwest and learn how animals and plants are adapted to the harsh desert environment. An indoor classroom that is an ideal site for nature camps and birthday parties, and a unique amphitheater is perfect for family-oriented concerts and performances. You will find restrooms and vending machines in this area. Stop by The Knoll for delicious lemonade, soft pretzels, and fresh-made cookies! Seasonal hours of operation.